The Breeze Fire Table is the best value, you get all the high-end durable materials without the costly price tag. This fire table can be customized to fit any design with multiple powder-coat colors and includes 20 lbs of decorative fire glass. With an all-aluminum powder coated frame and a stainless steel burner coated in a hi-temp black finish, the Breeze Fire Table burner is rated for temperatures up to 60,000 BTU’s. 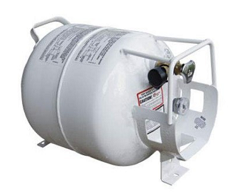 It comes standard with a BBQ propane tank hookup but also includes a natural gas attachment for those who want to run a hard gas line. The Breeze fire table is durably built but at a great value backed by Homecrest’s market best warranty. *Note: Due to clearance requirements if the 19” coffee height is chosen it requires a horizontal tank that is sold separately! Aluminum and Steel Frames (structural failures) and HDPE surfaces | 15 years residential and 5 years commercial | Aluminum and steel frames are covered from structural failures for 15 years from date of purchase in a residential setting and five years in a commercial setting. And five years in a commercial setting under normal usage, and is not the result of abuse or an act of God, Homecrest will repair or replace the frame, If replacement is required, and your original frame is no longer manufactured, we will replace it with a similar product. Homecrest will pay the warranty freight if within the first year in the Continental United States. Return of product will not be accepted without prior written approval. Painted Surfaces (peeling, flaking, or blistering) | 5 years residential and commercial | Painted frame surfaces are covered against peeling, flaking or blistering for a period of five years for both residential and commercial settings. If the painted surface peels, flakes, or blisters and the furniture has been maintained per the recommended care and maintenance instructions, Homecrest will repair or replace the frame at the manufacturer’s discretion. If replacement is required, and your original product is no longer manufactured, we will replace with a similar product. Homecrest will pay the warranty freight if within the first year in the Continental United States. Return of product will not be accepted without prior written approval.